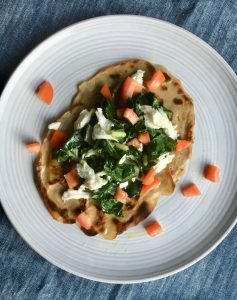 Buckwheat is gluten-free so this is a good recipe for anyone with an intolerance or allergy. It makes a good alternative to a sandwich. Heat some coconut oil in a frying pan and add about 2-3 tablespoons of mix per pancake. Lightly saute your chard, spinach or kale in a pan for 3-4 minutes. Add your sauteed greens, cheese and diced tomatoes to your crepe and enjoy!